— Continental Congress in the Northwest Ordinance of 1787. Never in my life did I think it would be necessary to defend education. But if the last decade of life in the United States has taught me one thing, it’s to expect a world turned upside down and never so much more so than when discussing education. 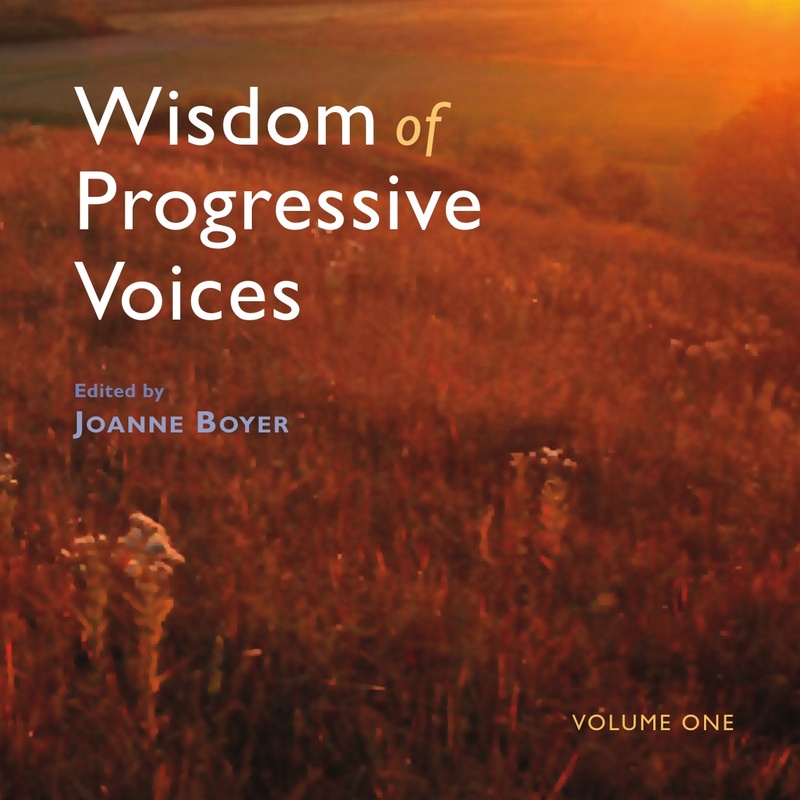 Have we once again forgotten our American progressive history? 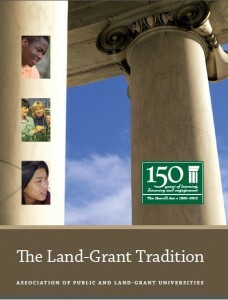 Remember “land grant colleges?” Sponsored by Vermont Congressman Justin Morrill, the Morrill Act was signed into law by President Abraham Lincoln on July 2, 1862. Officially titled “An Act Donating Public Lands to the Several States and Territories which may provide Colleges for the Benefit of Agriculture and the Mechanic Arts,” it also provided for classical studies so that members of the working classes could obtain a liberal, practical education. 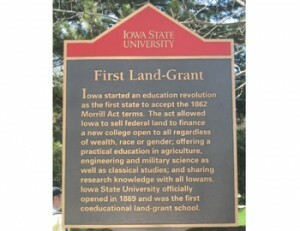 Iowa State proudly displays its land grant heritage. The Morrill Act provided each state with 30,000 acres of federal land for each member in their Congressional delegation. The land was then sold by the states and the proceeds used to fund public colleges that focused on agriculture and the mechanical arts. Sixty-nine colleges were funded by these land grants, including Cornell University, the Massachusetts Institute of Technology, and the University of Wisconsin at Madison. For a complete list of “land grant” colleges established from 1862-1890 click here. Virtually every Big 10, Southeastern Conference, and Big 12 university started with a commitment to public education that was rooted in the idea that the educated life is the lifeblood of any society. Research for agriculture, forestry services, and veterinary medicine as well as a broad-based liberal arts education were established by the federal government and administered by the state government for the “common good” of its people. How much do “all of us” benefit from our state higher educational systems? Just one example from the University of Nebraska and how its extensions benefit the entire state: In 2007, an independent study found the University of Nebraska–Lincoln’s Institute of Agriculture and Natural Resources (IANR), provides at least a 15-to-1 return on the state tax dollars Nebraska invested. That means that the “rural” communities benefit from government-sponsored programs as much as anyone else. State colleges brought higher education within the reach of millions of students, a development that could not help but reshape the nation’s social and economic fabric. No longer was education just for “elites” but rather, it was now part of the “commons.” How ironic that in 21st century America, the right wing talk machines have labeled education as something for the “elites,” when in fact the whole idea of public education was to enrich the public good. It wasn’t until the last 30-35 years with the advancement of “trickle down” economics that public higher education has gone out of the reach of We the People. Support of public higher education has a strong history in the United States. Government working for all of its people. There are two key elements at play here in the attack on public education by Republican-controlled state legislatures. Clearly one is an economic theory that says if the very wealthy among us don’t pay their fair share of taxes, some how government revenues won’t be impacted. But also as crucial is the idea that an educated society is somehow a bad thing. Common sense (thank you Thomas Paine) should tell us that neither of these bogus claims hold water no matter how much 24-hour so called news shows tell us differently. Wisconsin provides us with perhaps the clearest view of the how and why education is being attacked at such deep levels. Wisconsin Governor and 2016 presidential hopeful Scott Walker, a college drop out himself, has gone after the prize of national public education with reckless abandon. In a nutshell, the Wisconsin governor, doing the bidding of the Koch Brothers, who loathe public education, plans to reduce the University of Wisconsin system so that it can be drowned in the proverbial bathtub, to quote Grover Norquist. But the destruction didn’t stop at the UW system. Walker quickly turned to gutting the Wisconsin Department of Natural Resources, with most of the cuts hitting scientific-based research. The less science the more room for politics. The “Wisconsin Idea” which has been the focus of this great PUBLIC university has been destroyed by Gov. Scott Walker. Much attention has been given recently to his “rewrite” of the Wisconsin Idea, the very foundation of that University, which grew out of the establishment of the school as part of the land grant movement. Established in 1904, The Wisconsin Idea holds that research conducted at the University of Wisconsin System should be applied to solve problems and improve health, quality of life, the environment, and agriculture for all citizens of the state. Just wondering if anyone in rural Wisconsin, whose votes affirmed the re-election of Scott Walker, has ever benefited from research done throughout the UW system or if a graduate of any of those schools provided services to those rural communities. We need to be reminded that whether urban or rural, government can and does benefit the “commons,” the “public,” all of us. Government is not a multi-national corporation beholden to stock holders, who demand quarterly profits no matter what the human or environmental costs. Government is designed to benefit all in society. To try to equate the idea that somehow government should be run like a business makes for an unsolvable calculation. You can find out more on on to Save The Wisconsin Idea by clicking here or visiting the Save The Wisconsin Idea on Facebook or twitter. The public. The commons. We are part of a society that benefits when we all move forward together. That is no more evident than when we promote public education at all levels, as the founding fathers clearly understood. This entry was posted in Campaign Finance Reform, Citizens United, Democracy, FEATURED, Social Justice, Thoughts on Life, Wisconsin Politics and tagged education, higher education, land grant colleges, Scott Walker, the Morrill Act, University of Wisconsin. Bookmark the permalink.